Fire is the element of summer and is associated with the emotion of joy. Fire people love to reach out and form relationships with all people. They enjoy laughter, communication and passion. They love to please people and need to be constantly reassured and loved. However, out of balance, the Fire type may be too vulnerable, too sensitive and sometimes may carry a sadness or lack of inner joy. This may be masked by inappropriate joy and laughter. They may have become ‘burnt out’ like the grey ashes of a fire and become too frightened and too cold to trust in love again. Shen resides in the heart relating to consciousness, thinking, affections, memory and sleep. Earth is the element of late summer and is associated with the emotion of sympathy and empathy. Earth people have the ability to nourish like a mother can nourish a child. Thus food and understanding are important. In times of worry or despair you may turn to an Earth type for comfort or as an‘agony aunt’. However, out of balance an Earth type may become ‘smothering’ and over controlling or conversely they may feel a sense of emptiness or neediness in their own life because their empathy and sympathy has been used up on caring for others. They may be constantly worrying and ‘chewing things’ over and over in their mind. Intellect or Yi resides in the spleen being responsible for thinking, memory and concentration. Water is the element of winter and is associated with the emotion of fear (or lack of fear). Water people have a persistence and determination and will often excel in situations that others find too scary. They may “feel the fear but do it anyway.” They may be ‘driven’ and are often high achievers, explorers or ‘daredevils’. Out of balance they may hide a deep sense of being frozen or washed away with fear and may become isolated. Zhi resides in the kidney it relates to will power, determination, consistency and drive. Wood is the element of spring and is associated with the emotion of anger and assertion. In balance Wood people have the skill to project into the future and the strength and ability to form strategies and make decisions; they have great vision. They can be great leaders and motivators of people. Wood people may often want to ‘heal the world’ and demonstrate for worthwhile causes. Out of balance a Wood type may have no hope or vision for the future; they may procrastinate; they may become frustrated and angry. Hun resides in the liver it relates to life aims, plans, and projects. Hun is affiliated to blood which need to return to the liver so it can settle to elicit restful sleep. 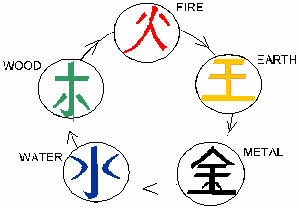 Fire burns down which represents earth. Earth treasures are the metals found in it. Metal is represented by air when they meet it forms condensation or water. Water is needed to nourish wood. This is known as the generating cycle. Each element represents a part of the environment we live in, functions in our mind, body and spirit. The direction and movement of this energy define our health and wellbeing.